All are welcome! We encourage you to invite friends and family. Let’s get informed and healthy together. Education is a top priority here at Kinstruct Health Chiropractic & Wellness. 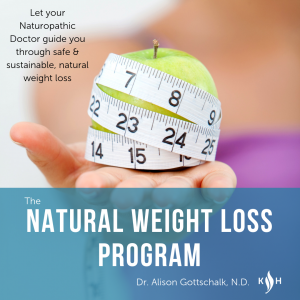 Our healthcare practitioners are experts in their respective fields and have a passion for connecting with our community through regular wellness workshops and community/corporate outreach events. For more information about our community and corporate wellness workshops or talks please contact us at admin@kinstructhealth.com. With chronic disease and mood disorders on the rise, it’s time we learn more about the power of our choices. Nutrition is foundational to our well-being. If you want to perform at a high level and live a life of abundance, energy and fulfillment it starts with taking better care of you. There is power in educating yourself about your body, and how it works. Learn how to feed your brain for success! Join Dr Laura Dobrinsky on February 27th and learn how to “Feed your brain” for success! Review of medical history, physical assessment, and standard blood work, if over 6 months. One-on-one counselling, with adjustments to supplements/vitamins to maximize your success. 5 Weekly Progress Assessments – Review blood report findings; individualized modification if needed. Take home guide for the next 6 weeks. 6 Week meal plan. Choose from an assortment of approved recipes and local restaurant menu options. Option: Connect with others through a members-only Facebook group, with daily clarifications to questions by Dr. Gottschalk. Courageous Self-Care: Cultivating Courage and Confidence to be you and live your best life. – Dr. Laura Dobrinsky, B.Sc., D.C.
Why do we feel stuck or anxious when it comes to making big changes in life. Why can’t we make the move? Why can’t we commit to long term change? Why is it so hard when we know it’s best for us? If you are a mom, maybe you feel guilty wanting more for your self. No matter what your situation or aspiration, the science is clear. Self care isn’t selfish it’s necessary. 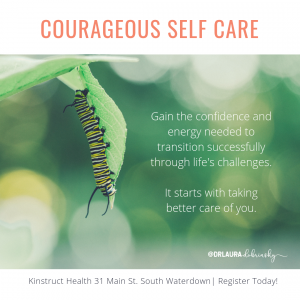 Join Dr. Laura for a new workshop titled “Courageous Self-Care”. Learn the science behind change, and develop the growth mindset needed to cultivate the courage and confidence you need to simply be you. Healthy, happy and inspired. Chances are you’ve heard the buzz about FAT these days. The terms; “KETO”, “KETOGENICS” and “PALEO” have been getting a lot of attention, and for great reason. Research is clearly demonstrating the health benefits of a low-carb, high-fat diet as a powerful lifestyle change to achieve the goal of brain health and functionality (Henderson, S. J. Neurotherapeutics, 2008). Brain cells function with far greater efficiency when they are utilizing fat (ketones) as a fuel source as opposed to sugar. Learning to use FAT FOR FUEL can be beneficial to your BRAIN HEALTH. Presenters; Dr. Laura Dobrinsky, discussing belief barriers and mindset for a lifestyle change. 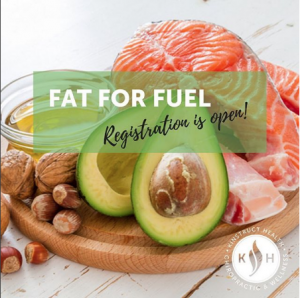 Dr. Alison Gottschalk a Kaley Metler (Fitness Coach/Ketogenic Lifestyle) guide your understanding and implementation of using “Fats for Fuel”.